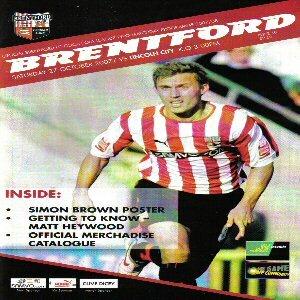 Brentford was a ground I was never particularly looking forward to visiting. It was in London and traffic is always bad around there, plus it just looked like a complete shithole on the TV and the pictures that I had seen. So I drove with trepidation down to Brentford, making it to the street parking areas in quite a reasonable 3 and a half hours, including a stop and taking London traffic into the equation. It was just street parking around the ground and thus the problems began for people who arrived later. The streets filled up very quickly with people wanting to park and all the spaces were practically taken by the time it was 1pm. 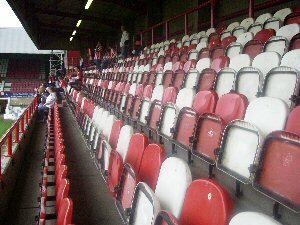 The Brentford fans around the ground were generally quite nice, which made a pleasant surprise, and they were all more than willing to let away fans into their pubs. Other than the pubs there isn’t a lot to do around the ground, with the exception of standing outside the away turnstiles and waiting for the gates to open. For someone who doesn't drink, pubs aren't a big attraction for myself so that ruined the day even more for me. Wouldn't it be nice if some clubs catered for those fans who didn't actually drink? At a surprisingly early 1:30 the gates opened and we were allowed in. With the lower-deck of the away end closed, we were all in the seated deck on top and it offered a fairly decent view of the action. The only problem being that although you could see the line, the steepness meant that anyone sitting in front of you practically blocked the view of the whole goal. 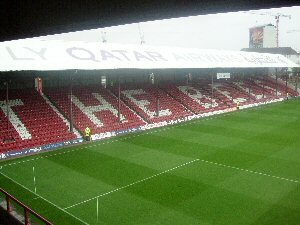 By the time kick off came we couldn't see most of the goal and I was tempted to sit at the very front of this stand. It was also extremely cramped as well as roughly 700 seats were squeezed into an area that would barely hold 500, meaning that there was no leg room whatsoever, and for any fans who stand at over 5’8 or so, you will struggle to sit comfortably and will more than likely spend the game standing. Looking out I was actually quite impressed and found it to be a much better ground than I was anticipating. The stand to our left was the newest at the ground, and other than the plentiful amount of pillars it was quite a decent stand. 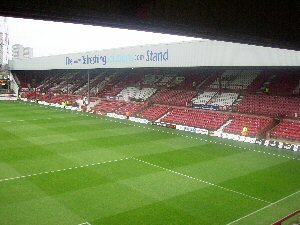 The stand opposite the away end was a terrace with a newly constructed roof on top of it. 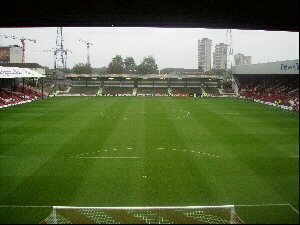 The final stand was similar to the one at Chesterfield, elevated high above the pitch with what appeared to be mainly wooden seating. The away end allowed for a good atmosphere, but the rest of the ground was very different with Brentford fans seemingly not willing to make any noise whatsoever. This kind of spoiled the day as it was very quiet. However, I generally enjoyed my trip to Brentford and would come again (even though the score below might not reflect that) if City were playing there, but not for a random game. However, I wouldn’t drive it again as it took us nearly 2 hours to get out because of London traffic.